So with the first realization that I might not get to stand on the summit, I was pretty friggin bummed. But I still had hope despite the horribly gloomy outlook. Snow was coming down hard now and we were getting destroyed by the wind. But I understood that the weather wasn’t the problem. We could bundle up and proceed no problem. But where we were, where we had to go, and where we had come from all had a risk of avalanches, especially after large snowfall. We climbed for probably another 45 minutes to an hour and it got much worse. Raul told me what he was thinking and we climbed up behind a large boulder peeking out of the snow. As Raul skirted around to the side of it I shined my headlamp down into the void directly below us. 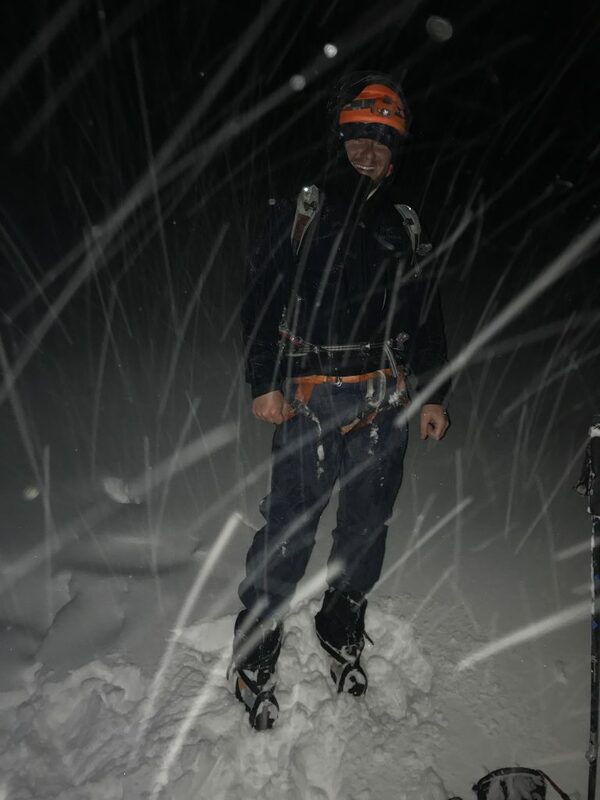 It was a far enough drop that my headlamp couldn’t reach the bottom and we were standing on a maybe two foot ledge of ice and snow on the edge of it. He told me we would wait here and give it another shot. The other speedy climber was with us and joined us in the shelter of the rock. We kicked and dug seats in the snow and sat back against the choss pile behind us. I donned my big puffy down jacket and cuddled up into a ball to stay warm while we sat. With cold legs and warm everything else I could’ve sat there for days. But the weather wasn’t going to cooperate and I had to keep reminding myself that this wasn’t about my ability to stay warm. The other climber readjusted and bumped me and I realized just how freaking weird the whole situation was. Here we were, likely overtop a crevasse or cliff and I was so jittery him simply brushing up against me made me want to scream. Once we all got comfortable we sat there in silence, the wind and snow pelting our hoods and screaming in our ears making it not quite as much the winter wonderland we had experienced down lower. 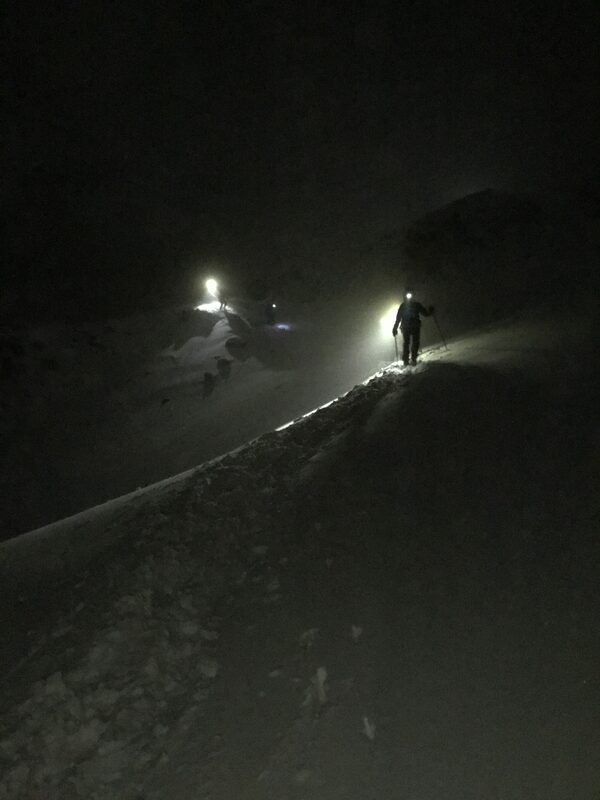 We all turned our headlamps off and sat there in the darkness. 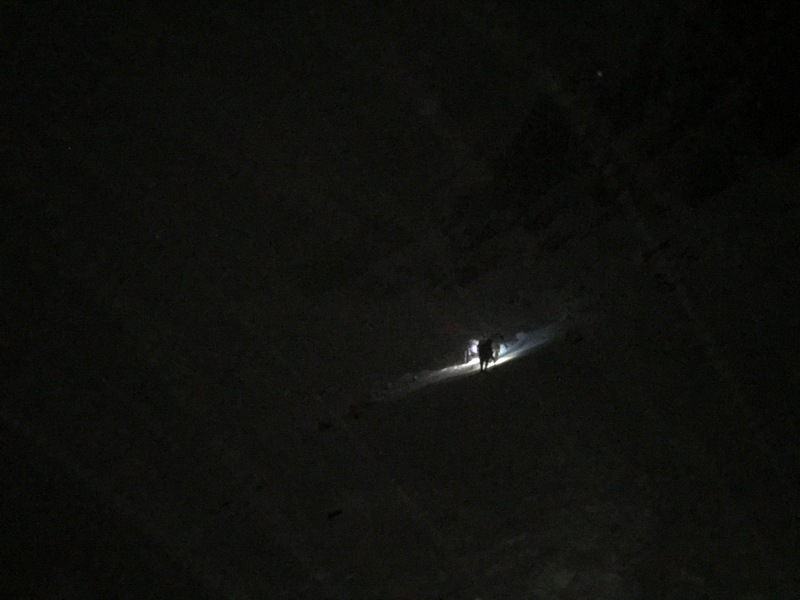 The other two climbers slowly made their way up the mountain and we heard faint screams through the wind. I could see their lights just 30 meters down from us but it seemed like an infinite distance away. The other climber and Raul went down to them rather than waiting the likely 10 minutes it would take them to get to us. They all decided to turn around and didn’t hesitate to get moving back down. Raul turned around and came up to me and even just a couple feet away he had to scream over the wind to let me know what he was thinking. We’d give it another 30 minutes. When we finally gave up on the hope of it getting better, a hope Raul probably realistically knew was gone hours ago, we booked it down. Within 15 minutes we had descended drastically and the conditions were already improving. 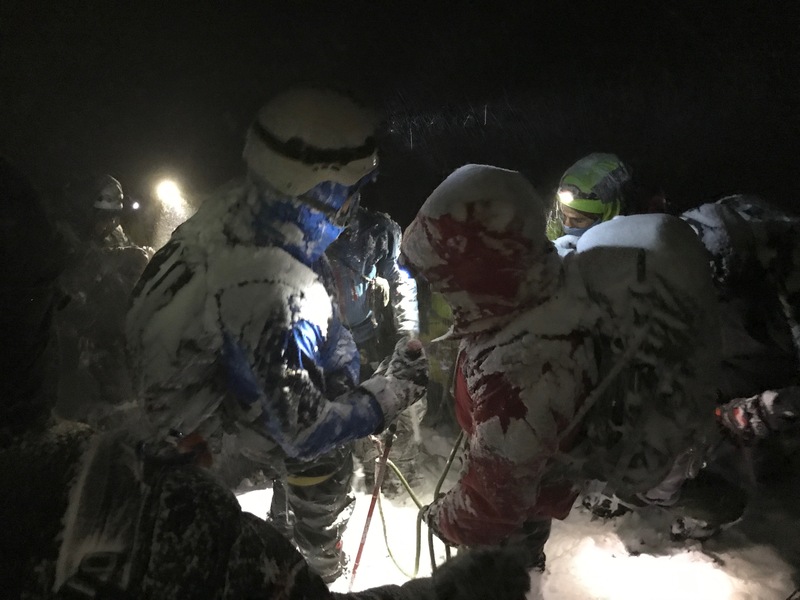 We caught up to a whole group of climbers who were collaborating on what to do and were starting to rope up for the descent. Raul chatted for a moment and I took some pics, turned some of the snow yellow, and then we kept on heading down. The rope trains were honestly freaking me out. We did our best to stay out of their way or at least keep uphill of them and pass quickly. 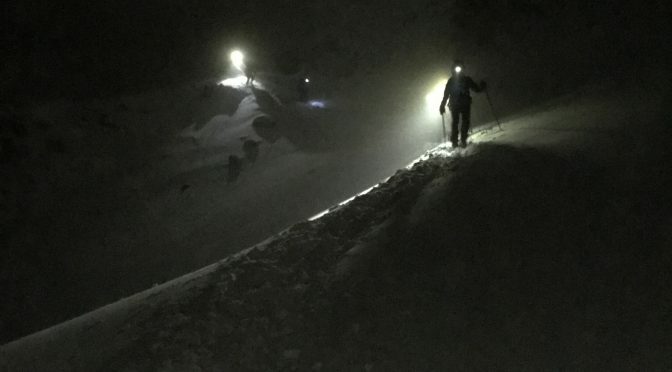 But watching some of the clients who didn’t have the fitness or coordination on deep snow falling all over the place made me personally vow to never ever rope up with strangers or people who can’t be vetted by people I trust. I get the purpose of rope teams, but on stable terrain, even with the tremendous consequences of a fall, the better option to me simply seemed to not fall in the first place. Raul and I passed all the climbers and eventually we removed our crampons once the grade leveled out and I removed the bulky puffy I had donned to keep me alive up higher. But the paths we had ascended earlier looked like a different world compared to what we were coming down. Dirt trails were covered in four inches of fresh powder, dropped in just a few hours since we had passed through earlier. What began as a beautiful night turned into a blizzard. Back at the refugio climbers rolled in, kicking off boots and removing wet gear before entering. Inside they gave each other drawn out hugs and pats and returned to the dining room for coca tea and pastries. 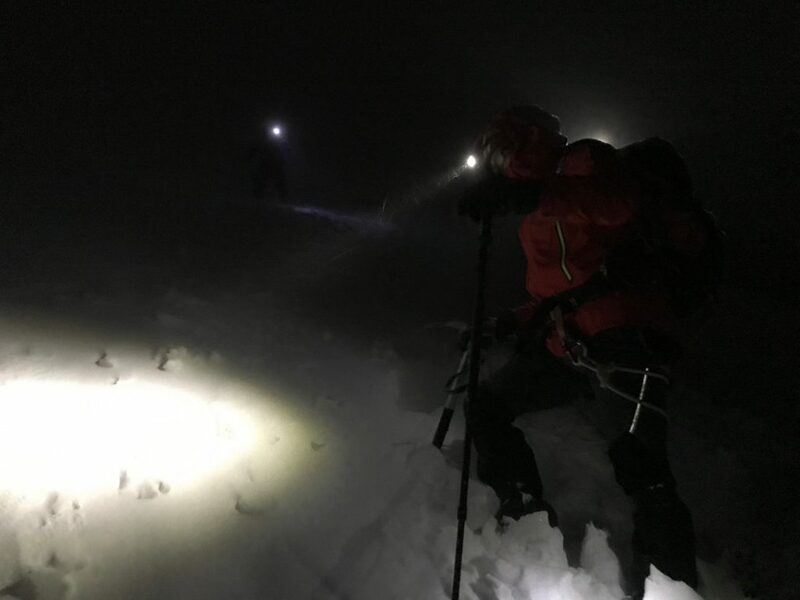 Everyone was obviously very happy to have made it back down safely and I realized that what had seemed mundane to me as a naive client simply along for the ride, definitely scared a lot of the other climbers. It was gnarly up there, no doubt about it. 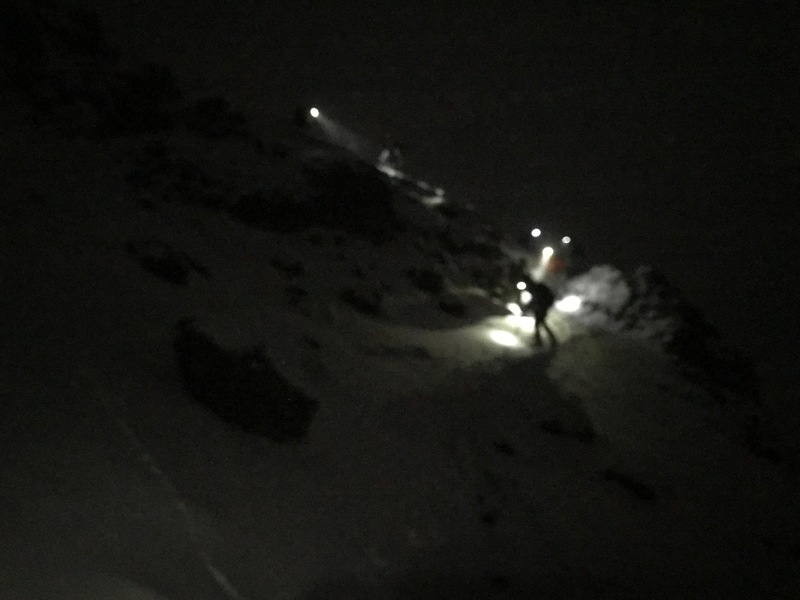 And it was dark, and cold, and super super steep. It brought some perspective to what we were doing. This wasn’t going for a hike back in Virginia. It was legitimately dangerous, nothing like the Himalaya, but still possessed risk, and some risks that are out of our control. At the refugio next morning I told Raul he better keep working Chimbo because I was coming back. 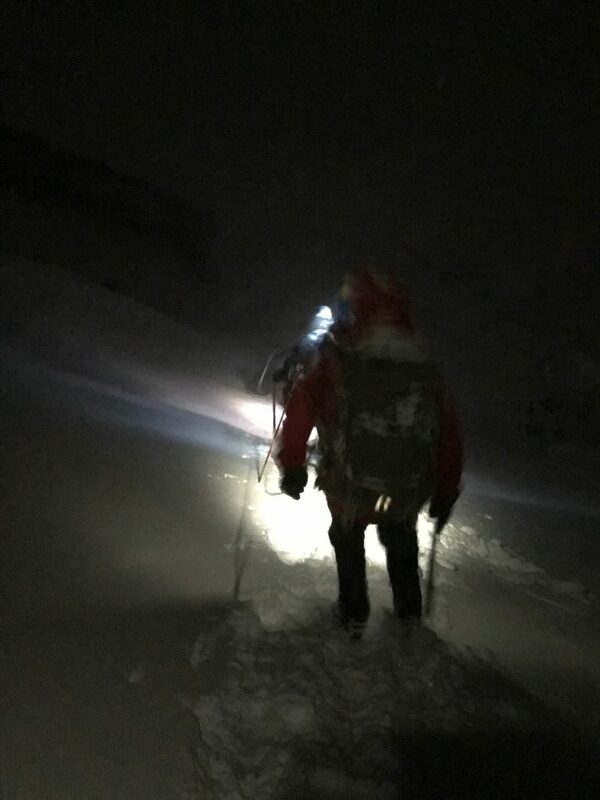 I was disappointed we didn’t get to summit, sure, but with all the crazy crap I do, I’ve learned that sometimes a success is simply getting home alive. At this point I probably possess a 1/2 attempt to summit ratio. Include my disappointments on the Appalachian Trail and the attempts to kayak to the Bahamas and that number drops ever further. At first it all bugged me, but I’ve learned that with trying anything hard there’s going to be the chance of failure. So whether it be med school of high Andean volcanos, I’ll keep on trying.